There is something to be said about being witness to the past. I distinctly remember watching the McCarthy Hearings (House Committee on Un-American Activities) on TV and thinking (at that time), “What a scum Bag!” The pervert had us checking under our beds for Communists. I also remember my neighbors being dragged away in broad daylight never to have returned to their homes. They were accused of being Commie sympathizers. In 1950 McCarthy ‘claimed that there were 205 ‘card carrying communists that worked for the U.S. State Dept.’ This set the stage for a witch- hunt that went after anyone deemed a threat to our national security including ‘sexual perverts or shady characters. (Think the homosexual problem including 91 people suspected of being ‘shady’). Payne's thesis is based on “The Lavender Scare” of the 50’s McCarthy era. 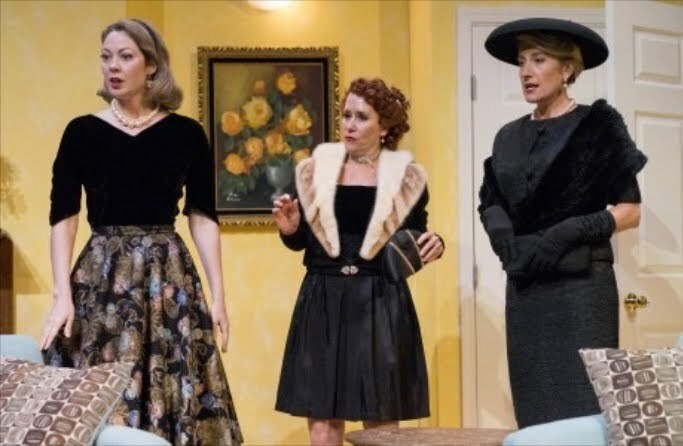 It is with this backdrop that Intrepid Theatre Company is mounting Topher Payne’s “Perfect Arrangement”, at The Horton Grand Theatre through March 12. It’s a wanna- be comedy that morphs suddenly into a mouth dropping tragedy. The cast of Perfect Arrangement with Laura Bohlin, John DeCarlo, Joshua Jones, Jennifer Paredes, Brooke McCormick, Cynthia gerber and Tom Stephenson. The play opens in Bob (John DeCarlo) and Millie Martindale’s (Laura Bohlin) living- room -apartment. 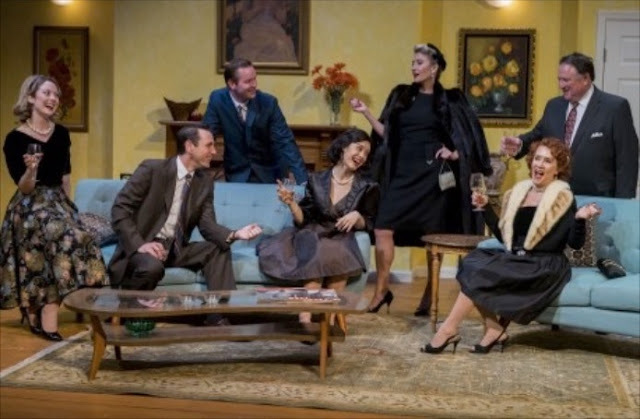 With them are Jim and Norma Baxter (Joshua Jones and Jennifer Paredes) and Kitty and Theodore Sunderson (Cynthia Gerber and Tom Stephenson). Bob and Norma work for the State Department and Theodore is their new boss. In the background sounds of Sha-boom (Life could be a dream) can be heard as the beautiful people laugh and joke around. If one didn’t know better, one might think that they came in the middle of an “I Love Lucy” episode”, so exact is Gerber as the ditzy red headed mime of Lucy. Her zingers and near perfect timing keep the audience in stiches throughout the play even though they oft distract later on. As the others swoon about making small talk around drinks and recipes trying to make this little setup appear to be the ‘perfect arrangement’ the two couples can barely contain themselves until Kitty and Theodore leave the apartment. With a sigh of relief and a quick reshuffle Bob and Jim and Millie and Norma resume their proper places next to each other and the four settle, at least for the moment. You might guess though, not for long. Bob, the top investigator in his department and his secretary Norma, now have to go after gays as well as Commies. On the sidelines, Jim, a public school teacher and Millie, who once had aspirations of a writing career but keeps the home fires burning, are caught in the crosshairs as the perfect arrangement begins to show signs of stress. Artistic director Christy Yael-Cox directs this fast paced (almost too fast) not so funny comedy through hoops and hurdles as the net around couples gets tighter and tighter when the boss continues his demands to fire all those deemed risks and deviants, threatens to send Norma to another office and downgrade her position and a blast from the past catches up with Millie. A not so popular (read ready for the chopping block because of casual sexual affairs) Barbara Grant, (a wonderful Brooke McCormick) another employee/ translator of the state department, sashays back into her life and reminds her of indiscretions between the two when she was a teacher and Millie her student. This sets off alarm bells between Millie and Norma while putting Bob in a compromising situation. Once again things begin to unravel as the two couples plan and plot ways to bring Barbara down, save their own skins and resume their ‘normal’ lifestyles. Unfortunately as the four go off in different directions, so does the play. The quick turn about took yours truly by surprise as it veered off into uncharted territories; one not expected and almost out of the blue. Politics they say make strange bedfellows. While Payne’s play is not perfect, it is especially as relevant today as it was in the 50’s. That said the production suffers from some credibility gaps, notably the relationship between the women. 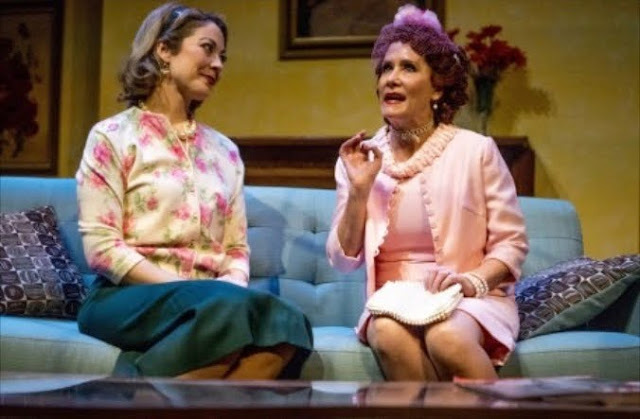 Given the fact that the play is set in the 50’s might be reason for the superficial affections both Bohlin and Paredes bring to the table, but I doubt it. This is after all, after years of fighting for their rights, the LGBT community is hardly holding back their feeling whether private or public. Theirs left much to doubt. The romantic connection never followed the dots. That might change as the play settles in. I hope so. The men fare a bit better, even though their characters are less developed. DeCarlo’s Bob gives a splendid performance as one who wants to go along to get and along and play ball, but is looking out for #one when all is said and done. His decisions, in the final analysis were showstoppers for yours truly. Joshua Jones’ Jim has little more to do than be funny when needed. His overtly, perhaps over cooked body language and movements are never in doubt, but are barely noticed by the Sanderson’s who probably would never recognize a ‘gentleman who prefer, ah-the company-of other gentlemen’. Kitty’s comeback, “You don’t mean fags, do you.” Later on in Act II he convinces when his ‘perfect arrangement’ is falling apart and his mate is ready to take no prisoners. His fears for his job are real and it shows through. Both Gerber and Stephenson work well as the outsiders with Gerber dropping every offensive stereotype and nasty reference to race and religion known to man in the 50’s. Unfortunately they are making a strong comeback with this current administration. Stephenson is right on target as the no nonsense boss who barely breaks a smile. Jeanne Reith’s perfect and oft times stunning looking 50’s outfits brought back memories of another era. 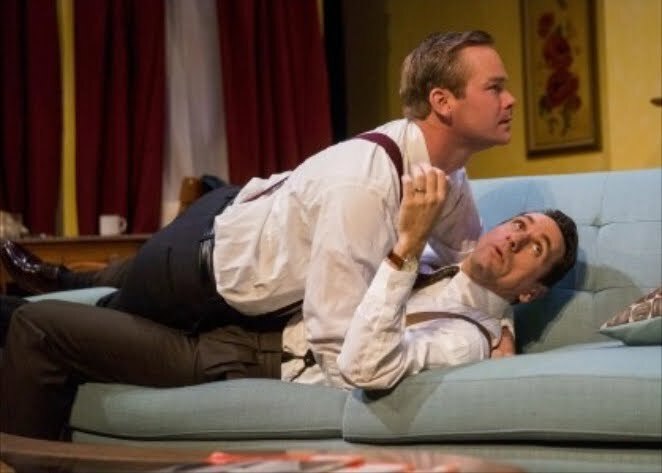 Sean Yeal-Cox set defines the play as when Bob and Jim leave Millie and Norma’s up scale Georgetown, D.C. apartment they exit through a closet door to go to their adjoining apartment when all is said and done. Clever! Karen Filijan’s lighting design, and T. J. Fucella’s sound design round out the high quality looking productions we have all come to expect from Intrepid Theater Company. Taking a page out of McCarthy’s playbook, we must be vigilant and keep our ears tuned into what’s coming down the pike especially with the new Att. General and the stripping away of everything the LGBT community and women’s rights advocates have fought for since Roe v Wade and Stonewall. “Perfect Arrangement” is a must see for those who carry the banner of “Never Again” on more than just one front.